All throwing athletes should respect a “pitch or throw” count and make sure not to exceed that number. Young pitchers in youth ball should not throw a curve ball. 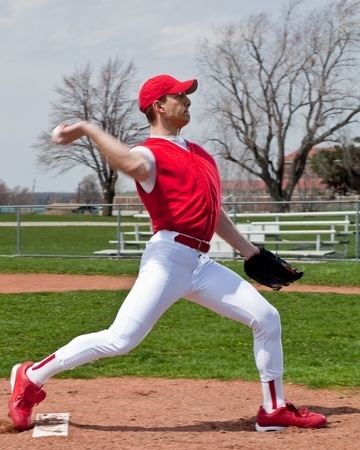 Proper throwing mechanics can eliminate excessive valgus stress on the elbow. Seek guidance from your Physical Therapist to avoid or care for an injured elbow. If you watch baseball, you may be familiar with the Tommy John Surgery. This surgery repairs a ligament in the throwing elbow. Throwing a ball “over-hand” requires the arm to move in a way that puts excess valgus stress on the inside aspect of the elbow. Any sport that requires that involves throwing a ball overhand also involves repeated stretching of the ligaments in this area, leading to laxity and pain. Increased laxity can lead to arthritic changes in the elbow joint, and the pain is so great that the “thrower” cannot tolerate it and has to stop. Normally, this injury cannot be rehabilitated without surgery. This surgery is named after the Tommy John, one of the top left-handed major league pitchers of all time. In mid-season of 1974, John was leading the Dodgers to their first National League pendant when he injured the Ulnar Collateral Ligament (ULC) in his pitching arm. The outlook wasn’t good, and many people thought John would never pitch again. The team doctor, Dr. Frank Jobe, performed the first ever ULC repair. John took a year to recover and returned in 1976, pitching with an amazing 10-10 record. Since that time, the surgery is commonly performed on injured pitchers. The elbow joint is made up of the Humerus, Radius and Ulna. The bones are held together by ligaments which are more like leather than rubber bands. On either side of the joint there are collateral ligaments: medial and lateral. 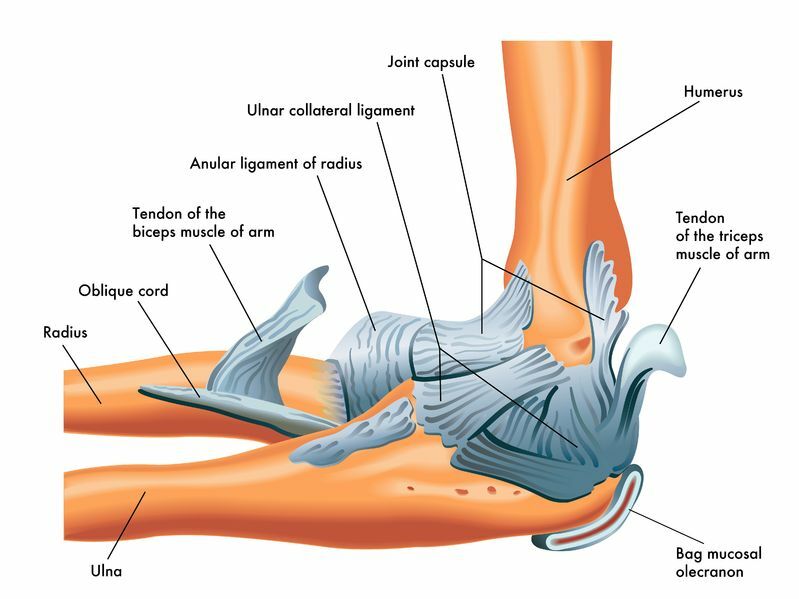 These ligaments give medial support and prevent excess valgus motion in the elbow. Most daily activities do not place too much valgus stress the ligament. In pitchers and some other throwing athletes, the excessive valgus stress can lead to damage. The procedure to repair the medial collateral ligament or Ulnar collateral ligament (UCL) is known as the Tommy John surgery. The surgeon will repair the torn/damaged ligament with a piece of a tendon. The Palmaris Longus Tendon is the most commonly used tendon, and it usually is taken from the ipsilateral side. If this tendon is not available, the Gracilis or other tendon from the donor bank can be used. The surgeon drills a tunnel that extends from the Humerus to the Ulna, and the tendon is placed with in the tunnel and “docked” via sutures. For the next 6-8 weeks, the new ligament must be protected through limited motion occurring around the elbow joint. For up to 6 months or longer, the ligament must be protected from throwing and other stressful activities. Ultimately, the surgeon will determine when a throwing program can begin. Physical Therapy begins immediately following the surgery. First, the patient will wear a “range of motion” limiting brace for 6-8 weeks following the surgery. The brace will be locked, but will allow a certain amount of motion. During this time, the patient will be encouraged to actively move the recovering elbow within the limited range of motion. While formal Physical Therapy can begin immediately, some doctors require the patient wait for 3-4 weeks, allowing the elbow to “settle –down.” If Physical Therapy is initiated immediately, the focus will be to reduce pain, swelling and re-establish normal neuromuscular activity in all of the muscles that are not directly related to the involved elbow. The Physical Therapist will not avoid any activities that might over stretch the new ligament such as excessive stretching or passive motion exercises. Over stretching can make the ligament lax, and it will not be able to provide the static support to the joint. Prior to returning to a throwing program, the patient will be educated on various plyometric and eccentric exercises that will prepare the involved arm for the amount of stress that it will experience when the throwing motion occurs. The patient should maintain the strength of the core and lower extremities during the entire rehabilitation process. Cardiovascular exercises can be performed throughout the rehabilitation process, also. Pain: The pain tolerance of patients differs greatly. The most intense pain is felt within the first two weeks of the surgery. The pain is managed with medication, ice, and therapy. One helpful way to reduce pain is through gentle motion and exercise appropriate for the acute post op phase of healing. If there is considerable swelling and inflammation throughout the elbow joint there will more pain therefore it is imperative to control the swelling. There might be bleeding from the suture sites, but this should be minimal. Bruising might occur in the area of the surgery and extend into the forearm. Gentle message to this area can reduce the sensitivity. Wearing a sling: The patient will use a sling to support the arm while the arm is protected by the brace. The sling is for comfort and can be removed as soon as the patient feels comfortable and confident. Sleep: Sleeping is difficult for most surgical patients because they may have a hard time getting comfortable. In the first several weeks/months, the patient will not be able to sleep on the involved side. Some patients are instructed to wear their sling while they attempt to sleep. Driving: Returning to the driver’s seat is determined in part by which arm is involved and in the sling, if the transmission is automatic, and if the patient has quit taking narcotics.The doctor ultimately determines when you are ready to drive. The active use of the R UE will be limited for several weeks. If you feel comfortable driving with one arm and the involved arm grasping the steering wheel at the “6 o’clock” position, then you can usually begin driving within the first 2-3 weeks. Returning to work: Depending on the type of work, you could return to some aspect of your work within the first two weeks. If your job is physical, you’ll have to discuss a return date with your doctor. Based on the progress of your surgically-corrected arm, the surgeon will determine when you’re capable of returning to work and in what working capacity. If the patient’s job is one of a professional baseball pitcher, he might not return to the team’s pitching rotation for more than 1 year. Most of these athletes are restricted from throwing a “normal” pitching amount for the first 2 years following the surgery. Having fun: Returning to hobbies, recreational sports and all leisure activities will be determined by the doctor and physical therapist. The more physically demanding activities can take 3-6 months to return to. The repair must heal and the strength must be developed to handle the demands of the activity. Throwing a ball will begin around the 4-6 month post-op. The patient will begin by throwing a lite weight ball (Nerf Ball or sponge ball) and gradually progress by throwing a heavier ball, more repetitions, and greater distances. This progression will take several months to complete and it might be 9-12 months before the patient can throw at a pre-injury level. Tommy John surgery was first performed over 30 years ago and unfortunately has become more prominent in all ages. More and more throwing athletes are playing their sport year round and their arm never has time to rest. The surgical procedure is very successful, but the rehabilitation time is extensive. If the patient is willing to follow the protocols of the surgeon which are directed by their Physical Therapist they should experience a successful return to their sport.